Tag line: "Unlike other musicals West Side Story grows younger!" A 20th century take on Shakespeare’s 16th century stage play Romeo and Juliet, West Side Story is a dynamic musical that’s just as vibrant and alive today as it was in 1961. Two rival New York street gangs, The Jets (whites) and The Sharks (Puerto Ricans), are preparing to face off against each other. Riff (Russ Tamblyn), leader of the Jets, recruits his best friend (and former Jet) Tony (Richard Beymer) to help in the upcoming rumble. The problem is, Tony has fallen in love with Maria (Natalie Wood), the sister of Bernardo (George Chakiris), leader of the Sharks. Hoping to prevent the two gangs from fighting, Tony is instead drawn into a confrontation that takes a disastrous turn, threatening to destroy his budding romance before it ever gets off the ground. Yet Tony and Maria can’t ignore their love for one another, and, despite the opposition of those closest to them, search desperately for a way to be together. Shot, in part, on the streets of New York, West Side Story convincingly updates Shakespeare’s classic tragedy for a modern audience. 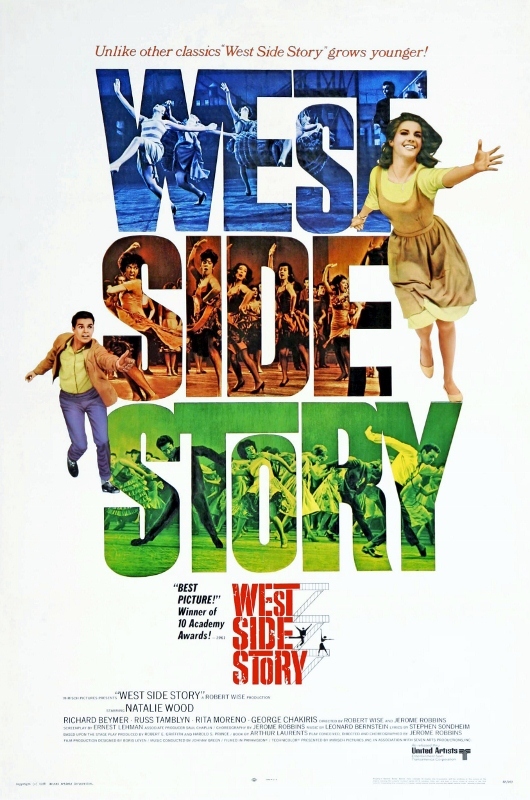 Some of the performances are strong, including Tamblyn, Chakiris (who won an Oscar for his work here) and Rita Moreno, who plays Bernardo’s fiery girlfriend, Anita, yet what makes West Side Story a remarkable motion picture is its music. Written by Leonard Bernstein and Stephen Sondheim, many of the songs in West Side Story are unforgettable. The opening of the movie, a lively introduction to both gangs, is magnificently choreographed, as is “America”, a rooftop sequence featuring Moreno and Chakiris that’s positively electric. There are other great tunes as well, such as the romantic “Maria” and the whimsical “Gee, Officer Krupke”, but, for me, “America” is the film’s best musical number. Its energy is second to none. Those familiar with Romeo and Juliet will know going in that West Side Story isn’t gonna end well, but that doesn’t detract one bit from the movie’s entertainment value. 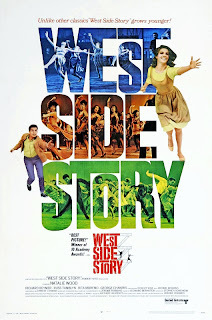 Much like 2001’s Moulin Rouge, which told a similarly downbeat tale of love, the fun of West Side Story is in the journey, and it’s certainly a spirited ride. One of the great musicals. Are you sure it was shot in NY? It's been a while, but I remember it as looking like a soundstage. Robert: Parts of the film definitely were shot on a soundstage, but some scenes (the opening, for example) were shot on-location in Manhattan, in areas that were, at the time, condemned (and where the Lincoln Center currently stands). Thanks for the comment! They're always appreciated. Golly, I hate that movie! I hate almost everything about it! I read the play before I ever saw it and it was a lot of fun (being Shakespeare). But when I finally saw the film I was horrified at how crappy it turned out. Russ Tamblyn was good, though.